Joe Root's twin hundreds in the ODI series against India in July earlier this year might just have paved way for a turning point in his Test career too. Infamous for the 'mic drop’ celebration, the twin hundreds were just Root's second and third hundreds across formats in the calendar year. Not if you are a lower middle-order batsman with a terrific strike rate in an average cricket team. Root, though, is England's lynchpin and Test skipper and importantly had 10 fifty-plus scores across formats in the year until that ODI hundred against India at Lord's. Only one of those - against New Zealand in an ODI - was converted to a hundred. That is a worrying trend, especially when you are the main peg in the batting line-up. However, beginning from that series against India, the English batsman has six fifty-plus scores, four of which have been converted to tons. In Sri Lanka, as Root racked up a crucial hundred in a series-sealing win at Pallekele, he was probably also batting away accusations regarding his poor conversion rate of fifties to hundreds in Test cricket. And not just in 2018! Since his debut, Root has as many as 56 scores of 50 or more in Test cricket. Despite him being one of the four premier batsmen of the current age - the other being the trio of Steven Smith, Virat Kohli and Kane Williamson - Root isn't considered a class above any of the aforementioned names and one reason could be his inability to score as many tons as fifties. 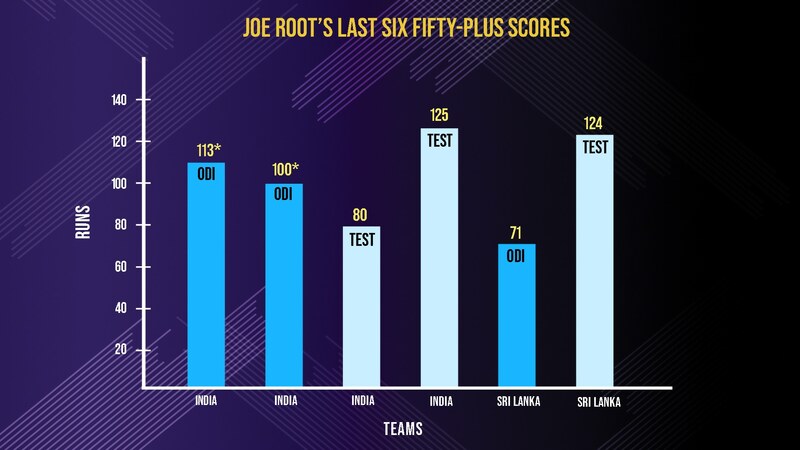 Root's 56 fifty-plus scores since his debut is the best for any batsman in this time frame. It is ten better than that of the next best, David Warner. Steven Smith has 45 such scores while Virat Kohli and Kane Williamson have 36 and 37 respectively. 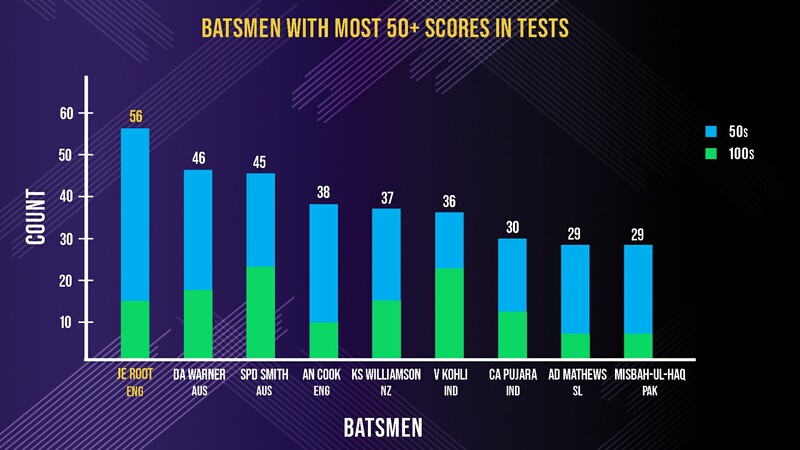 All of them, barring Williamson though, have more hundreds than Root.The England batsman has the joint fourth-highest number of hundreds – the same as the New Zealanders’, but in 28 more Tests. This suggests that while Root is the best amongst the lot in getting a start and registering a fifty, he somehow fails to convert the fifty into a big score. Only 15 of his 56 fifty-plus Test scores have been converted to 100s, a conversion percentage of 26.79. This is poor by any stretch of the imagination. Compare this to Virat Kohli (61.11%) or Steven Smith (51.11%) or Kane Williamson (40.54%) – and Root’s conversion percentage suggests a big problem. The magnificent ton against Sri Lanka at Pallekele is his second ton in the year in Tests. Crucially, he has converted two of his three fifty-plus scores in Tests to hundreds since that mic-drop ODI ton against India. If Root can continue to convert his 50s into big hundreds then he might well overtake the quartet and get into a league of his own.